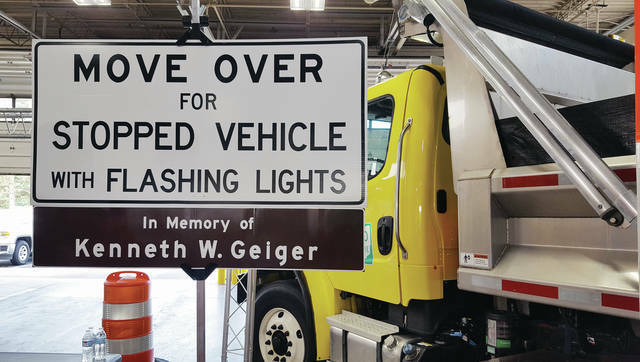 Randy Cole, Ohio Turnpike executive director, gave replicas of a Memorial Sign in honor of Kenneth W. Geiger to family members on Friday during a ceremony in Swanton. This sign reminding motorists to drive safely will be located on the Ohio Turnpike in memory of Kenneth W. Geiger. All it takes is one person driving too fast or not paying attention in a work zone to change the lives of many forever. That is what happened to Kenneth W. Geiger, his family, and co-workers when he was killed while working on the Ohio Turnpike in 1983. 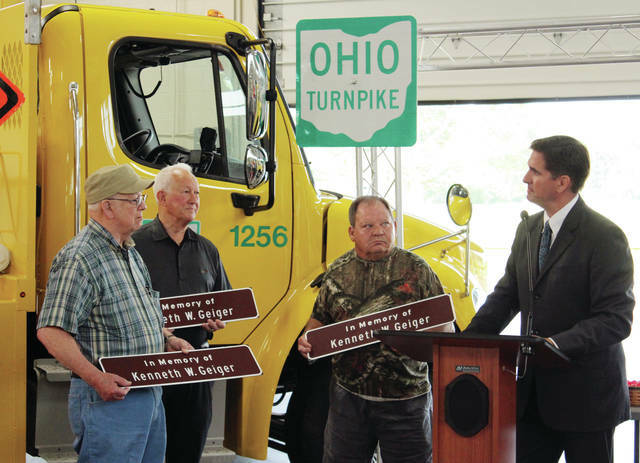 An Ohio Turnpike Memorial Sign in his honor was dedicated during a ceremony Friday morning at the Swanton Maintenance Building. The memorial sign program is part of the turnpike’s Work Zone Awareness Campaign and its efforts to remind motorists to move over for vehicles with flashing lights. Randy Cole, Ohio Turnpike executive director, spoke of the importance of driving safely. “Help us spread the word, so that we don’t have ceremonies like this in the future,” said Cole. Geiger, of Delta, was 53 when he was struck and killed by a semi-tractor trailer while working for the Turnpike Commission. He was a maintenance roadway worker at the Swanton Maintenance Building for 17 years. Co-workers Keith Buckenmeyer and Peter Bates, both of Swanton, were also injured in the incident, Buckenmeyer critically. Bates was among those on hand for the ceremony Friday. The Memorial Sign is located at mile 47.3, westbound on the turnpike near Swanton, in Geiger’s memory. It serves as a reminder for motorists to move over, or slow down, for workers and first responders. “We hope that when people go past that sign, they look up the story of Kenneth Geiger and understand it’s not just a name, it’s a story, it’s a family, and it’s something that could be prevented,” Cole said. Among the family members in attendance were Geiger’s brothers, Jerry Geiger and Robert Geiger, and Kenneth’s son, Larry. They received replica memorial signs. In total, plans call for 13 men killed while performing their duties on the turnpike to be memorialized with a sign. Among the remaining workers to be honored is Trooper Jon D. Birchem of Ohio State Highway Patrol Post 89. Birchem died in 1967. Surviving family members are encouraged to contact the Ohio Turnpike’s Communications Department at 440-971-2066 to help arrange for him to be properly recognized.